Chipotle has lost its top ranking as America's favorite Mexican-style restaurant brand. 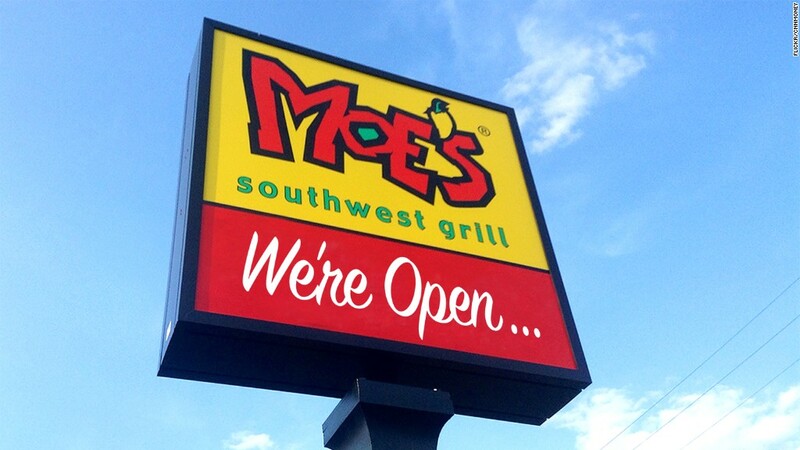 Moe's Southwest Grill is the new favorite, knocking Chipotle (CMG) out of the top slot that it's held for years in the annual Harris PollEqui Trend. The poll, which is owned by Nielsen, measures the strength of brands based on consumer surveys. To make matters worse, Chipotle has even fallen behind Taco Bell, owned by Yum Brands (YUM), in the rankings. Chipotle did not return messages from CNNMoney. But the company's reputation and bottom line have been plagued by a widespread health scandal that caused hundreds of people to get sick last year. Moe's took aggressive measures to fill the vacuum. When Chipotle shuttered all its locations for a four-hour food safety meeting on Feb. 8, Moe's swooped in with a full page ad in "USA Today" that chided its rival: "We're open, especially on February 8th." Chipotle reported a double-digit drop in revenue and same-store sales in the first quarter of 2016, compared to the same time period last year. Sales were also hurt by the fact the company gave burritos away for free in an attempt to win back customers. The company posted its first loss ever in the first quarter of 2016. Then had been a hit with customers who preferred its farm-friendly food philosophy. But then about 500 customers around the country became sickened by multiple outbreaks of foodborne illnesses over the course of 2015. The CDC said the outbreak was over in February of 2016 and Chipotle has revamped its food preparation practices. But clearly, the damage has been done. Moe's did not return messages from CNNMoney. But a spokesman for Yum said that Taco Bell revenues totaled $9 billion last year. Taco Bell recently opened its first location in China and has experimented with new menu items at other restaurants, like alcoholic beverages in Chicago. Qdoba Mexican Grill and Baja Fresh Mexican Grill took the fourth and fifth spots, respectively, in the Harris Poll. The Poll also rates Italian-style restaurant brands. The winner? Olive Garden, owned by Darden (DRI). Cristina Alesci of CNNMoney assisted with this story.